If you’re shopping, sightseeing or just strolling through St. John's, Paradise Café is the spot to refuel with full-flavored local cuisine. 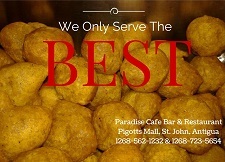 Located at 17 Pigott's Mall, the culinary gem is owned and operated by the lovely Guyanese couple, Simone & Richard Sinclair with a cheerful and welcoming staff. A local diner with open-air courtyard charm serving hearty breakfasts and lunches. Breakfast costs just EC$5, and the lunch menu starts from EC$10. The service is quick and efficient. There’s a good selection of lunch options, staples include delicious local dishes like ducana, seasoned rice, pork, fish and turkey. They also offer baked chicken, bakes & salt fish and traditional Guyanese cuisine. Best advice: Give the Fish and Plantain Chips a try – you won’t regret it, and will find yourself coming back for more. 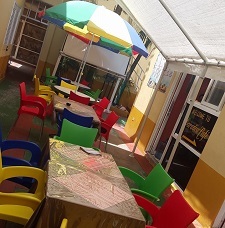 The best part is you can enjoy Karaoke Night with your friends on Fridays while enjoying local drinks, beers and spirits and the delicious fish and plantain. Free Wi-Fi is icing on the cake! Whether you are a weary shopper, busy businessman, or a seasoned local or visitor, you’ll have a fantastic experience at Paradise Café, Bar & Restaurant. It’s a great place to relax, escape the bustle and crowds of the city or gather your strength during a trip in St. John’s. Call (268) 562-1232/723-5654, email: paradisecafe268@gmail.com or just stop in!